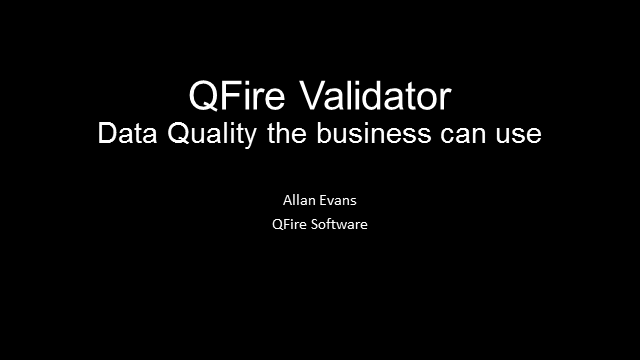 QFire Software’s approach to Distributed Data Quality provides a framework for its Users to Understand, Collect, Validate, Protect, Monitor and Enrich their data. QFire a relatively new entrant to the data space sits across the data acquisition, preparation and quality areas as a low cost, low impact, simple and easy to use solution. In 2013 Gartner included QFire as a Cool Vendor in its MDM and Information Governance category and has subsequently also included reference to it in its Gartner Predicts for BI and Analytics 2015 report and the Data Quality Magic Quadrant for 2014 as one of the other vendors to be considered. QFire will deliver a short walk through showing its Distributed Data Quality approach and ability to link to external BI systems using Yellowfin BI.